When I stepped aboard the bite-sized Avalon Panorama, I had no idea what to expect from a ship built to navigate a quarter-mile-wide waterway. 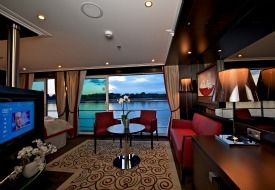 The 166-passenger and 47-crewmember cruiser (the ninth Avalon Waterways vessel to be inaugurated into the European river cruise fleet since 2006; two more are in the pipeline for 2012) sailed a five-night christening voyage from Frankfurt to Amsterdam on May 13 and docked at historic countryside and city ports on the Main, Rhine, and Mosel rivers. Designed more like a floating hotel than a cruise ship – a characteristic of river vessels – the 443-foot-long Panorama is short enough for passengers to walk from the self-serve beverage station at the back to the outside viewing deck at the bow in less than five minutes. This ship trades commercial ocean liner facilities like casinos, theaters, and climbing walls for truly exclusive touches, such as floor-to-ceiling windows in public spaces and suites, insightful local tour guides, and the Silent Drive System for soundless cruising, so you can enjoy the rolling riverside without the background hum of a motor – at unexpectedly affordable prices. Not for big-ship junkies, the Panorama’s on-board activities are limited to gawking at passing vineyards and castles, eating decadent meals on a schedule (no 24-hour snack bar here), and enjoying the unobtrusive sounds of hired evening entertainment in the lounge. Passengers suffice with impeccable service, an active daytime city-touring itinerary, and comfortable, luxurious quarters – a viable alternative to exploring small, European towns and villages by renting a car or bussing around. Staterooms: Rooms and suites aboard the Panorama nail down every luxurious appointment, including Avalon Comfort Collection upscale bedding, L’Occitane toiletries, marble bathroom counters, flat-screen televisions, and nightly turndown service. Royal and Panorama Suites also boast the signature wall-to-wall windows with French balconies (and up to 30 percent more space than industry standards). Staterooms and suites are well-suited to host passengers for Avalon’s repertoire of 13- to 16-night river voyages: Three-door oak closets with shelving, nightstands, work desks, and extra chairs and coffee tables outfit the sometimes long-term living quarters. Food and Drink: If nothing else (hardly), patrons of the Panorama are well-fed. Meals on board are intimate and detailed, consisting of three or more dinner courses, extensive breakfast buffets, and quintessentially European lunches (picture crust-less finger sandwiches). If there’s room in your belly for more, there’s always coffee and cake in the afternoon. Breakfast and dinner are held in the main restaurant on the first floor, and lunch and cocktail hour are served in the third-floor lounge – precisely so guests can do just that. Both spaces offer unrivaled views of centuries-old waterfronts. Each morning, I methodically nibbled my way through a breakfast buffet of made-to-order eggs, cold cuts, cheeses, smoked salmon, bacon, muesli, and sparkling wine to top off the feast. Grill-style lunches on the top deck are a favorite, with German sausages, steak, coleslaw, and more on offer. For dinner, guests have the choice between several dishes per course, with vegetarian and healthier options always on order. It’s worthwhile, however, to try the main menu at least once, if not every night, as courses are carefully chosen and crafted by a surely superhuman galley staff of just 10. The chef’s creations include creamy eggplant soup, tender beef with mashed potatoes, German dumplings with mushroom sauce, and often a cheese plate as one of the nightly dessert selections. An occasional wine-paired dinner service highlights delicacies like foie gras. For cocktails any time of day, the lounge bar will accommodate most beverage requests. Entertainment: Chances are, if you’re going on a river cruise, you’ve come to appreciate the act of recreational observing. So, sit back and enjoy the view, whether it’s gabled fortresses and castles or cosmopolitan cityscapes. Attend the cruise director’s port lectures, venture out with world-class local guides, and work up an appetite for lunch. After-dinner cocktails are complemented by the gusto of a hired band or a smooth piano player.